Every time I read or type up this story, it breaks my heart and makes me cry. But, for me, it is a wonderful and interesting reminder that we humans are so much alike other species with whom we share our beautiful planet. 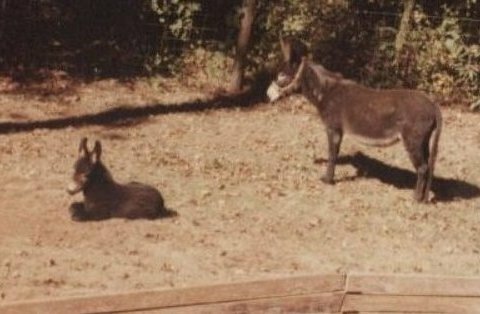 Shorty was a famous burro who lived in Fairplay, Colorado. He worked his whole life at mines around town for various owners. When his last owner left town, he simply left Shorty behind. During severe winters when deep snows covered the grassy areas, he went hungry for long periods of time. In time, he became blind. 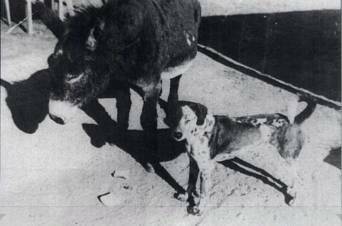 On a cold night in the fall of 1949, Bum, a stray dog, discovered Shorty in a pasture at the edge of town. Shivering and cold, Bum nestled up against the shaggy burro and they kept each other warm that night. From then on, they were constant companions. Bum would lead his blind friend along the city streets to the outskirts where there was grass and waited patiently while Shorty grazed. Wherever Shorty went, his best friend, Bum, was always with him. During the winter, the two had to resort to begging for food to survive. Bum learned which residents would give them food and would lead Shorty to those doors, who would bray to announce their arrival. The cook at the Hand Hotel made sure they had warm pancakes and biscuits right from the platter that was about to be served to paying guests. Whatever food Bum was given, he would lay it in front of Shorty. Only after Shorty had eaten would Bum himself eat. Johnnie Capelli, the courthouse janitor, befriended the two and during bitter cold weather made a bed of hay for them in his garage and parked his car outside. On one particularly cold night, he smuggled them into the heated courthouse, where they slept in the jail. The next morning, he had to clean out the cell before the sheriff arrived. One late spring morning in 1951, as Bum and Shorty were making their breakfast rounds, a chipmunk darted across a vacant lot across the street. Bum instinctively chased him. As Shorty stepped off the curb to follow Bum, a car hurtled around the corner, hit poor Shorty, and raced on, leaving him broken and bleeding. He died before anyone could come to his aid. Not knowing what else to do, someone loaded Shorty on a wagon and took him to the town dump. When Bum disappeared, Johnnie Capelli found him keeping a lonely vigil at Shorty’s side. For days, he would not leave Shorty and refused to eat or drink. While the city of Fairplay would not spend the money to bury Shorty, they did cremate him. The people of Fairplay were so touched by the devotion between the blind burro and the stray dog that they took up a collection and erected a granite monument in their memory on the courthouse lawn. Shorty’s ashes were buried next to it. Only weeks after Shorty’s death, as Bum was crossing the street near Shorty’s grave, he was struck and killed by a semi tractor trailer. Some say that in his grief, he may have wanted to die. Bum was buried at Shorty’s side. Everyone at Amberwood Sanctuary is doing relatively well, except for all the rain. With very few exceptions, it has rained every day for the past several weeks, and it is usually very heavy rains. We are all so tired of being wet. 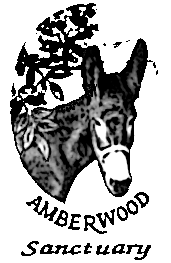 Remember, donkeys are desert animals, and this is certainly not desert weather and is not to their liking. They begin having problems with their feet when it stays so wet. A few of the donkeys are beginning to limp to the point that we will probably have to have a visit from the vet.